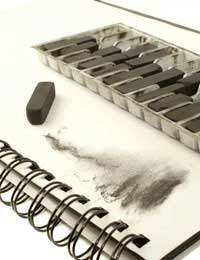 Charcoal is one of the oldest artist’s mediums and had been used by artists throughout the ages due to its ease of transport and its flexibility. It is made from the carbonated wood and it is the residue of this carbon left traced upon a paper on canvas surface, which creates its mark. Charcoal offers up a range of tones and effects not available to the pencil artist and really comes into its own for the ease with which it can be erased and redrawn. As a natural resource it is ubiquitous and common across all societies. Because of its ubiquity it is often used by children from an early age, although care is taken to avoid staining to clothes. Charcoal is a very physical and tactile medium, and artists will often manipulate the charcoal once it is on its ground (usually paper) with their hands or with a ‘putty rubber’. The putty rubber is softer than a normal pencil eraser and is highly malleable. Consequently, it can be turned over on itself frequently to avoid it becoming stained by charcoal. One downside of Charcoal is the tendency it has to fade over time as Charcoal dust deposits, transferred to paper during drawing gradually shift. The best way to avoid this is to use an aerosol fixative spray, applied to the drawing upon the completion of each session. Aerosol hairspray can also be used as a fixative. In both cases it is important to avoid ingesting the aerosol, which can be harmful. Charcoal is predominantly a tonal medium and is used to create dramatic drawings with strong contrasts of light and dark. The darkest tones are generally achieved by pressing hard on your charcoal stick, whilst the lightest tone can be achieved by leaving the bare paper exposed, or by rubbing through the charcoal with a putty rubber to reveal bare paper again. Tones in between can be created by varying how hard you press upon the charcoal, or by varying how hard you apply the putty rubber to an area of charcoal. You can also achieve different marks, varying in tone by smudging and moving the charcoal on the surface of the drawing with your fingers, or whole hands. One of the great things about charcoal is the way in which images begin to emerge from the greying paper, and can be made to disappear again with ease. Images sometimes leave slight traces that can be overdrawn, giving the final impression of a drawing reworked over time: the traces of previous marks create an impression of intense work and activity. The early drawings of Frank Auerbach (b. 1931), and those of Leon Kossoff (b. 1926) create this impression. Charcoal is considered an excellent medium for portraiture, because of the fact it can be used to evoke changing moods and expressions, and because of the ‘moody’ atmosphere that can be conveyed tonally. It is a medium that allows a lot of empathy to be conveyed between artist and sitter, and one that also allows for the movement of the subject of necessary, as changes can be made, and differing postures can be overlaid on top of one another.